Recently, I’ve noticed a series of letters being printed in the Star Advertiser again in an attempt to connect pesticides to any illness and now even death. The GMO issue has turned its target now into the public’s lack of understanding behind pesticides in the public. It’s a great tactic as so many folks don’t have a clue about why we need pesticides to begin with. The Hawaii Center for Food Safety is an expert in stirring the pot of hysteria once again. They, like many activists groups, use the general public’s lack of knowledge in basic science, law, and agriculture to create doubt. The messages they spread can create doubt from the well educated all the way to the least informed. It’s effective by really makes people fall into foolish stances when really challenged with logic and critical thinking. 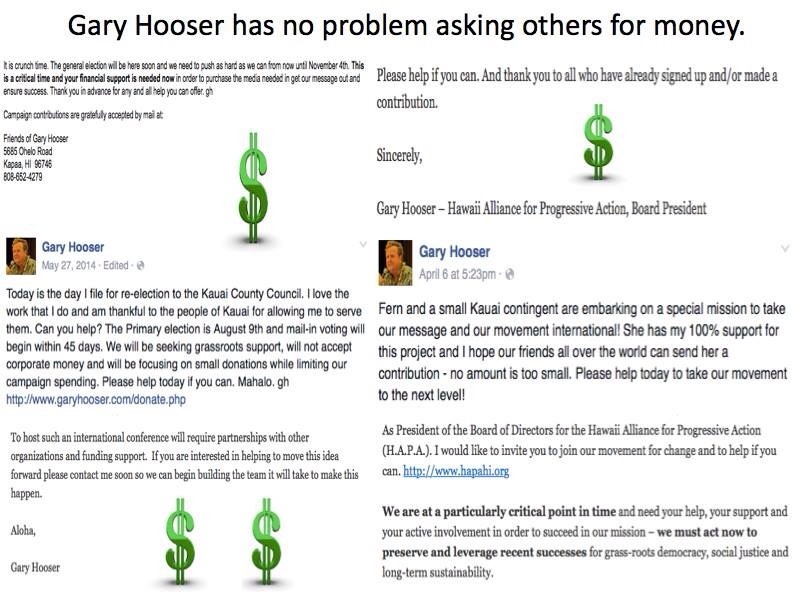 Gary Hooser also utilizes the same tactic with his Island Voices view regarding the recent ruling with the dust issue in Kauai. He takes advantage of people’s distrust and hate against corporations. He too uses hot words to stir up emotions of anger in an attempt to garner support for his cause. Joan Conrow’s blog easily rips apart his claims one by one. He continues to make repetitive statements to quell any possibility of questioning his information by his followers. He also knows how most of his followers lack of motivation to research any of the anti-GMO activists’ claims. Another sign that the Hawaii Center for Food Safety is ramping up showed up in today’s letters to the editor. Suzanne Luard Lenz tried to claim that pesticides from a non-biotech crop is responsible for the death of her father. The lowest level activists will quickly jump on to this as “proof” that pesticides must be banned or regulated even more. These readers won’t bother to ask the question of where’s her actual proof to support this claim and what other factors could have contributed to this. This isn’t proof of anything, just an assumption not backed by evidence. It’s also shameful that the Star Advertiser is printing this stuff. It’s clear that Gary Hooser and Ashley Lukens are at it again trying to rally their uninformed emotion based masses to support their cause. They are also fundraising for their coffers too which isn’t surprising either. One would think that all this money could really be put to a good cause like actually getting evidence to prove their points and determine the real sources of their issues rather than just speculate on it. The truth is that it isn’t about anyone’s health or standing with facts. When Ashley and Gary can tout Vandana Shiva as their spokesperson, it’s clear that the entire issue is just one of pure manipulation. The day that the anti-GMO groups like Hawaii SEED, the Center for Food Safety, and the Babes Against Biotech show their own transparency about their agendas and actually give something tangible to people, maybe I’ll see them as more credible. They should readily post the fees they paid Shiva to make the rounds here and match it with that same amount to gather data that supports their accusations. The discerned reader with a good skeptical eye can see what’s happening. The pot stirrers are at it again. How many unsuspecting people can we get on board again for the cause? It’s like the high school tactic of spreading a false rumor about someone and repeating it over so that it’s believed and never questioned. I’m tired of seeing people being made into fools by falling into this immature behaviors. 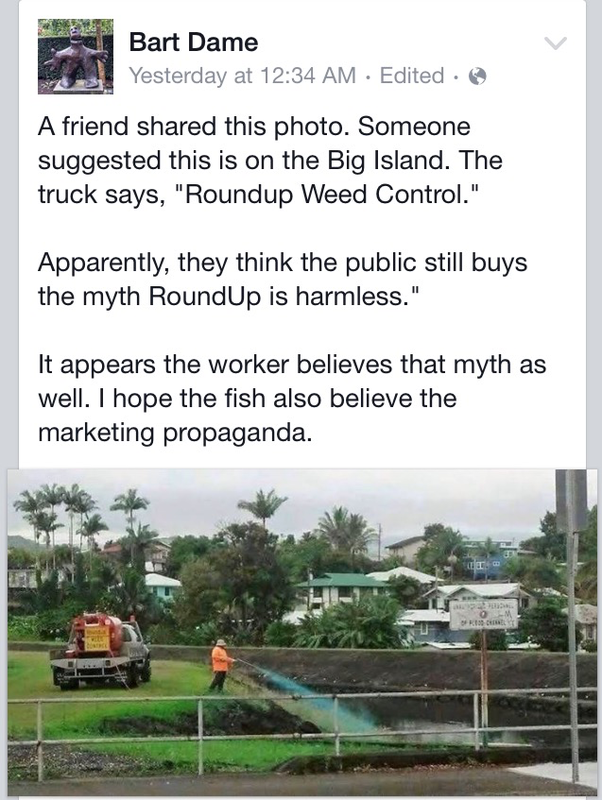 Photos of spraying anything stirs up the hysteria when unsubstantiated claims are posted with it. Instead of trying get the facts out, these people make assumptions about what may be happening. Note that those in the Democratic party supported the anti-pesticide law but that very law would have exempted the county and state as well as landscapers from disclosures. My dad said this was likely dye sprayed in landscape approved use of a herbicide which is common practice in the turf industry. It’s ironic that those who claim to love nature and environment tend to have the most dishonest type of tactics and yet demand transparency of others. Some feel that the farmers should submit to some of their demands to “work” with them. These people are not about collaborating and always have ulterior motives. No one should ever cave to the demands of the dishonest folks. It’s no wonder they protest instead of sitting down to an honest discussion to actually accomplish anything. ← It’s Time for the Rubbah Slippah Folks to Rise Up!